WE NEED AN ARTIST/ILLUSTRATOR FROM ALL 36 STATES THAT GAVE WOMEN THE RIGHT TO VOTE. 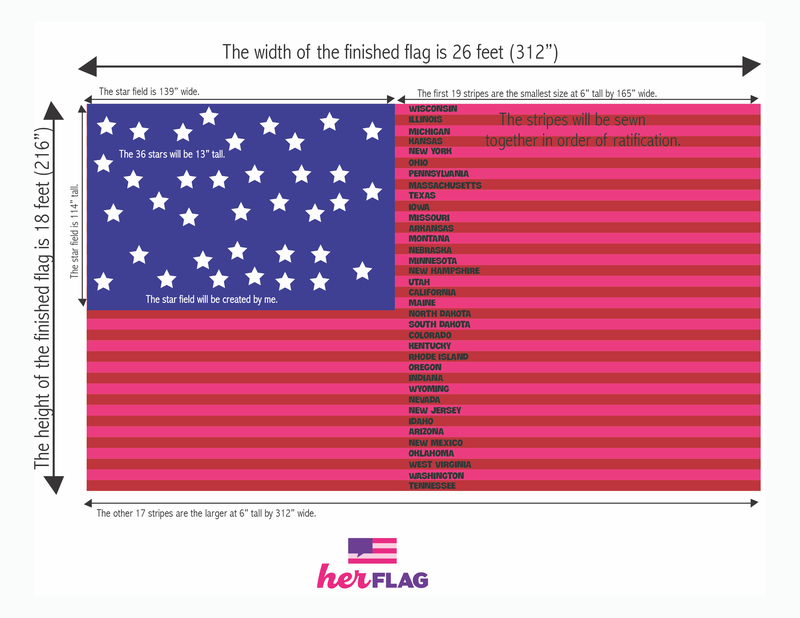 We are seeking 36 female/self-identifying collaborators in 36 states to help with the creation of a printed flag to celebrate the anniversary of the ratification of the19th Amendment that gave women the right to vote. The participating artists will represent each of the 36 states that helped pass the 19th Amendment. You need to be currently living in the state you are applying to represent. See the list of states below. You will need to be able to travel to the capital city of your state on a specific date to hand over your completed stripe and be a part of the public performance while your stripe is added to the flag. Selected artists will receive a $1,000 stipend. The finished flag will be 18 feet by 26 feet. There will be 36 stripes, one to represent each state that ratified the 19th amendment. The selected 36 pieces of art will be sent to Her Flag in a digital format. We will have all 36 separate stripes professional printed on commercial grade fabric ready for the assemble on the road. Each stripe will be sewn onto the star field and other stripes in each state by Marilyn Artus. NO SEWING IS REQUIRED FOR THE 36 ARTISTS. TINY DETAILS WILL NOT SHOW WELL IN THIS PROJECT. LARGE BOLD ART WILL BE THE MOST STRIKING. THERE IS A DOCUMENTARY FILM IN DEVELOPEMENT AND SELECTED ARTISTS MUST BE OK WITH BEING FILMED. The most important part of Her Flag is the travel to each state, meeting each of you and having you present your stripe for me to stitch onto the developing flag in your capital city in a public location. Educating the public about this important anniversary is a goal of this art project. WHAT I WANT YOU TO BE THINKING ABOUT IF YOU CHOOSE TO APPLY. This is a positive project. I would like you to celebrate this important anniversary in American history with your art making in a hopeful way. It is important to me that a diversity of political beliefs are included in this experience. I am interested in things that unite us. I want to celebrate and educate with this project. WHERE WILL THE FLAG BE EXHIBITED? We are working on securing venues for the exhibition of the final artwork in 2020. If you have a suggestion of where this could be displayed, please share any potential leads with me. Indoor and outdoor locations are both possible. The most important part of Her Flag is the actual making of the flag and collaborating with the selected artists. Where it will be displayed will evolve along the journey. -On your application you will be asked to select a Category, please select the state you live in and wish to represent. -NO NEED TO MAKE ANYTHING NEW FOR THE CALL APPLICATION. JUST ATTACH IMAGES OF YOUR PAST WORK SO WE CAN SEE YOUR STYLE AND GET A FEEL FOR WHAT YOU WILL MAKE IF SELECTED. -No need to be able to sew to be included in this project. -BOLD GRAPHIC WORK WILL TRANSLATE BEST FOR THIS PROJECT. Artwork should be 70-80 percent the suggested color. The artwork can be created in black and white allowing the digital editor to color the artwork the final color. The New York Foundation for the Arts is a fiscal sponsor of Her Flag LLC.